A number of incidents have taken place in the last two days in relation to Amanda Wells’ further ‘crimes’ of plagiarism. Not only has Lana Vawser and Katherine Ruonala personally contacted us, Apostle Steve Shultz from the Elijah List has just pulled all the prophecies of Amanda Wells. We can now report that Lana Vawser has responded to the case of Amanda Wells’ plagiarism. 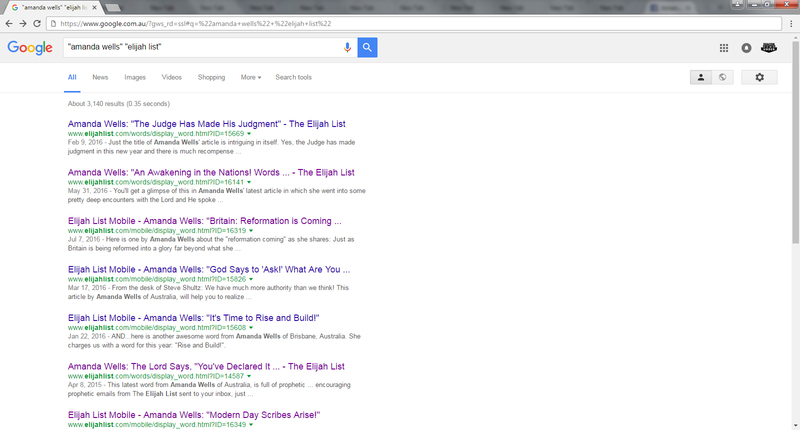 Unfortunately it’s a bit late for Katherine to tell Vawser that Amanda Wells is now “being investigated.” We were thorough in alerting Lana Vawser, Katherine Ruonala and head of the Elijah List Network, Steve Shultz, about Amanda Wells’ plagiarism BEFORE they spoke with her on the Australian Prophetic Summit 2015 platform. At this point we need to remind our readers the timeline as to how things unfolded last year BEFORE all the speakers spoke at the Australian Prophetic Summit 2015 . 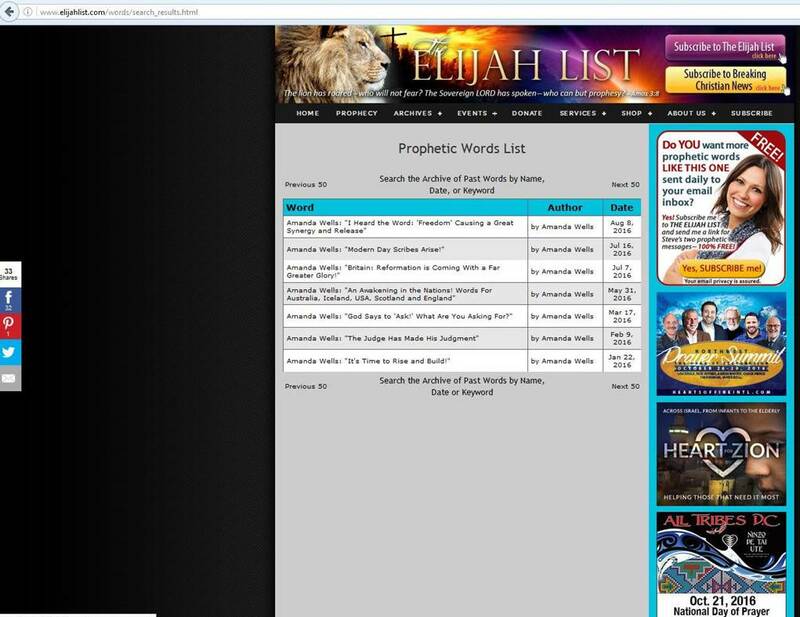 These are the before and after adverts of the Prophetic Summit when we alerted Ruonala to Amanda Wells plagiarism. We then reported this year that Katherine Ruonala continued to endorse Amanda Wells as a prophet, knowing full well that Wells was guilty of plagiarism. So what investigation is Ruonala conducting? Has she been stuck on Exhibit 1 on Weeding out Wells for over a year, not knowing how to navigate the site? However, Katherine Ruonala has indeed contacted us regarding Amanda Wells’ plagiarism. We will not disclose Ruonala’ message. However, coincidentally around the same time Ruonala contacted us, Steve Shultz (head of the Elijah List), weeded out Amanda Wells’ prophecies from his website. They now no longer exist. she was called out as a plagiarist back in November of 2015. Email all comments and questions to c3churchwatch@hotmail.com. Good work CWC. Keep their feet to the fire. Amanda Wells came to Scotland recently and spoke a lot of nonsense and gave prophetic words which were not accurate. Thanks for exposing her. That’s par for the course Rena. Unmitigated rubbish from this woman’s mouth on a regular basis. It’s time to call to account all these “pastors” who are inviting these wolves into their churches and putting their own sheep, whose well-being is THEIR responsibility, in danger. How are they ever going to answer to Almighty God for this? Rena – do you have any more information about what church this was? There was a church in Paisley called “Connect” which mentioned that she was preaching there not long ago. Was that the one? It would be interesting to hear more about your observations ……. sadly, as information comes to light there appears to be more to all this than meets the eye. If you have not already listened to Pastor Chris Rosebrough of Fighting for the Faith review some of Wells “sermons” you might be interested in checking them out. Hi Claudia. It was in Paisley, Scotland but I’m not free to name it. She has been a couple of times, maybe three. Sad to say, most of the leaders at the church think she is fine and that she is a true prophet, as do most people I’ve spoken to about her. They don’t seem to have discernment!! They want the church growth and numbers which she promises will come to the cities here.